Sadly, P-32, the only male mountain lion known to cross a busy LA freeway, was killed this week—crossing another freeway. Although we’ve known him since he was a kitten, P-32 (named because he was the 32nd mountain lion in Southern California to be tracked by the National Park Service, and not to be confused with basement-loving lion P-22) became well-known earlier this year when he headed north out of the Santa Monica Mountains. Mountain lions need lots of room, anywhere from 75 to 200 square miles, and when they get pushed to the limit, they’re forced to “disperse,” or find a new habitat further away from other cougars. But freeways create barriers that make that increasingly difficult for urban wildlife, causing all sorts of problems like starvation and inbreeding. 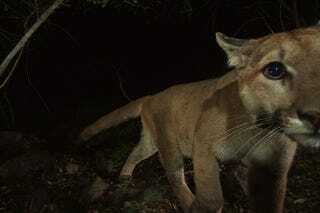 Somewhat miraculously, P-32 was able to cross the 101 Freeway and find a new habitat in a different mountain range. After thriving for several months, it appears that P-32 got trapped in competition with another male mountain lion (I mean, is this whole thing playing out like a Hollywood reality show or what? ), and that’s why he was forced to cross the 5 Freeway. Although P-32 made it safely across the 101 and other freeways, the 5 is much wider and more dangerous. He was struck by a vehicle north of LA around dawn on Monday morning. The National Park Service, which tracks many of LA’s species, including coyotes, reports that this was the 12th mountain lion that has been killed since they started the program. You can head over to their blog to see photos of P-32 being prepared for necropsy but I’d prefer not to look at those. Instead, let’s look at these adorable new baby mountain lions which were born in LA earlier this month. Meet P-43 and P-44. The circle of life.